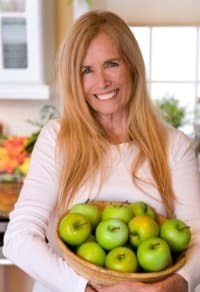 Mimi has been a vegetarian, then vegan, for several decades, which undoubtedly set the stage for her overall health, but she credits going completely raw a few years ago for where she is today. By the way, this isn’t someone who just burst on the scene from nowhere; read the bio of this amazingly accomplished woman. As a supplement to this review, Mimi kindly agreed to an interview and supplied detailed and helpful answers. Read my interview with Mimi here. I’ve been trying to do a 60% to 75% raw diet this summer. It’s easy to do during the warm season, when so many fruits and veggies are in abundance. But going 100% raw requires quite a commitment. Pure raw foodists sprout their grains and beans, and dehydrate anything that is normally baked, believing that the low temperature of a dehydrator doesn’t kill the living nutrients in foods. Those are the two areas that I personally haven’t signed on for, though I admire those who have. I do love all sorts of fruit smoothies and green smoothies; big salads that serve as meals; and I’ve really been enjoying using a spiral slicer to make “noodles” out of zucchini and other veggies. 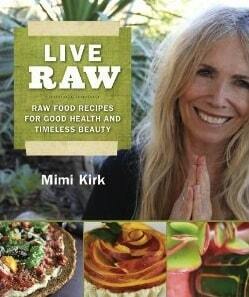 So I was personally ready for Mimi’s book for new ideas and to delve further into the world of raw foods. I’ve seen a number of books on raw foods but this one is the prettiest and most inviting, and not just because we see Mimi in several of the photos! She begins by talking about her views on healthy living and healthy eating, and introduces readers to the basics of raw living — equipment, ingredient other how-tos. I like her 25 Tips for Staying Young at Any Age; I still have such a long to-do list, both in terms of what I want to accomplish and what I want to experience, that I need a few more decades of good health and high energy! This book has recipes for every meal of the day, from breakfasts to desserts. I tried the Lettuce Wrap Salad, which was addictively yummy. I wasn’t obsessive about wrapping the delicious filling into the leaf, as I’m not a good “wrapper,” but rather, used the Boston lettuce leaf as a cup, and picked it up and ate it almost like a pita sandwich, with the lettuce standing in for bread. I was eager to try the raw cheeses, as I’ve tried making a few myself. The Basic Herbed Cheese wasn’t as firm as some I’ve made using agar as a coagulant, but it’s delicious, mildly nut-flavored, and with the consistency of cream cheese. For this use, it’s certainly better (so long as you’re not allergic to tree nuts) than commercial soy-based vegan cream cheeses. This soft “cheese” was incredibly good dolloped onto something I already had in the fridge, my Raw or Nearly-Raw Cold Beet Borscht. The Thai Pasta (the “pasta” being yellow summer squashes) is as ingenious as it is flavorful, a kind of raw Pad Thai that’s brimming with colorful veggies and amazing flavors. I’m looking forward to trying more of Mimi’s recipes and ideas. I do have a dehydrator but haven’t made friends with it yet, but some of her recipes might encourage me to do so. While I can’t see myself personally going full-out raw (I still like to cook as much as I like to “un-cook”), I’ve really been enjoying incorporating more raw foods into my diet. I definitely feel better when I eat more raw foods and fewer starchy carbs. Mimi Kirk is just the kind of engaging and inspiring mentor/role model I need, and Live Raw is a great guide. The one quibble I have with the book, which has nothing to do with its author, is the index. To do justice to a richly informative book like this, it should be better. Maybe it can be updated in (the inevitable) future printings. Here’s more on Live Raw on Amazon.com*(published by Skyhorse Publishing, Inc., NY, 2011). And read my interview with Mimi Kirk here on VegKitchen. MIMI, I HAVE NOW READ 2 OF YOUR BOOKS (LIVE RAW AROUND THE WORLD and LIVE RAW), AND MAY I TELL YOU THAT THESE BOOKS ARE TWO BEAUTIFUL, ENCLYCOPEDIC POWERHOUSES OF INFORMATION! I’VE BEEN READING MANY RAW FOOD BOOKS FOR 17 YEARS, AND NEVER HAS ANY BOOK HAD SO MUCH KNOWLEDGE IN IT. WOW! THANK YOU, THANK YOU, THANK YOU!